…and came to a screaming halt. Apparently yes. But let’s back up a bit. You can see the website above – it’s a development done in Venetian architecture with canals throughout. “Experience the unique charm of Venice and the crystal clear water of the Caribbean”. Odd. I have no idea why you would want Venice in Belize…I like Belize in Belize…but maybe that’s just me. Belize isn’t exactly known for chains of any kind. We don’t have McDonald’s or Subway or Wal-Mart or Starbuck’s – but that isn’t because it’s illegal. Belize is a small market (about 350,000 people) and import duties are pretty high. We DO have a few hotel chains – there is the Ramada’s Princess Casino and Hotel in Belize City and the Best Western Biltmore Belize City. Mahogany Bay Village on Ambergris Caye is developing their hotel under the umbrella of Hilton Curio and homes as part of the large magazine/lifestyle brand Coastal Living. And now…Wyndham Grand! I had to look it up to see exactly what Wyndham Hotels & Resorts are. Here’s what I found…the Wyndham Hotel Group includes TONS of brands. Days Inn, Howard Johnsons, Ramada, Super 8, Travelodge and Dream Hotels – it also includes RCI, the largest timeshare company in the world. Wyndham Grand exists in over 40 locations – larger, luxury resorts. Wyndham has a NUMBER of franchise possibilities…under all of their different names. You buy into the franchises and you get marketing, expertise, systems, etc. The famous Rialto bridge of Venice recreated in Belize from their website. 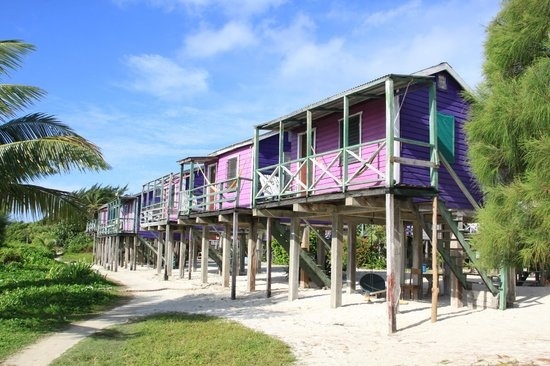 The website for the Wyndham Grand Belize is somewhat limited – and very similar to that for Venezia Del Caribe. And it would be great if this construction got started again both for those who might have invested in pre-construction and for the caye as a whole. Do I have all the answers? Not yet. But stay tuned. Great sleuthing, Sherlock! Keep it up!! Why thank you 🙂 I’m hoping to score a transfer to Washington DC with the scoop. They need help! but…but…..but that means you would have to wear real shoes again, as well as dump the khaki shorts, right? Hope to meet Captain Obvious. Here is a scoop, Rebecca…the Venezia del Mar was originally suppose to be built on our property on the lagoon. The owner bought the property sight unseen and was able to switch out titles once he saw the surrounding neighborhoods. The GOB now owns the property. REALLY. He bought a huge piece of property unseen? Oy vey. My understanding was it was an operative of the Canadian owner who made the purchase. I gather he was fired once he saw what was bought. O lord, project developers always find a way to make natural beauty fake and ugly. I am not a fan of big chains – but I do like the idea of already started and halted projects getting a big name…then we know it will be done and held to some sort of standards. A lovely cabin, pristine nature, the simple life, no luxury but amazing outdoor living, respecting nature. Its all being replaced with making tons of money, polluting, using too much resources to keep the AC running, filling mangrove to keep building, raising property prices so that much that local people cant effort it anymore.